Purpose: To investigate the feasibility of combining concomitant boost-accelerated radiation regimen (ACB) with full-dose mono-chemotherapy using cisplatin and to assess its local response and acute toxicity patterns in patients with advanced loco-regional head and neck squamous cell carcinoma (HNSCC). Materials and Methods: Between July 2004 and August 2005, a pilot study involving 27 patients with stage III to IVB (AJCC-6th) HNSCC of the oropharynx, hypopharynx and larynx who met the eligibility criteria was undertaken. Twenty-four of these patients (median age - 53 years) were analyzable. The radiation dose was 72 Gy in 42 fractions over 6 weeks, delivered in one daily fraction of 1.8 Gy during the first 3.5 weeks and two fractions per day, 1.8 Gy and 1.5 Gy boost-separated by >6 h interval, during the last 2.5 weeks. cisplatin, 100 mg/m2, was given in intravenous (i.v.) infusion on day 1 and day 22. Tumor and clinical status were assessed and acute toxicities were graded. Results: Out of 27 patients, 24 patients received both radiation and chemotherapy as per protocol and were available for analysis. The loco-regional response rates were as follows: an overall response of 95.8% (23 patients), a complete response of 79.1% (19 patients), a partial response of 16.7% (4 patients) and progressive disease in 4.2% (1 patient). Dysphagia, nausea, vomiting and bone marrow suppression were the most common side effects and were associated with cisplatin administration. One patient (3.7%) died of complications (pneumonia and sepsis), 3 patients (12.5%) had acute grade 4 toxicity and 21 patients (87.5%) had acute grade 3 (17 patients) or grade 2 (4 patients) toxicity. Conclusion: This data shows that it is feasible to combine ACB and full-dose mono-chemotherapy using cisplatin with manageable, although substantial, toxicity. The compliance to therapy was high and the loco-regional response achieved compared favorably with ACB alone or other concurrent chemoradiation regimens using standard or altered fractionation regimens tested by the Institute. It also compares well with the available literature. An extended phase II trial; and a new phase III trial, comparing ACB plus cisplatin against standard radiation plus cisplatin, are being planned at the Institute to determine whether the use of ACB in the concurrent chemoradiation setting further improves outcome. Improving the outcome for patients with locally advanced head and neck squamous cell carcinoma (HNSCC) by rational modifications of radiation fractionation regimens or combinations of radiation with chemotherapy has been the subject of intense clinical investigations for more than three decades. The two prototypes of biologically sound altered radiation fractionation regimens are hyperfractionation and accelerated fractionation. Hyperfractionated radiotherapy is based on preferential sparing of late-responding tissues when the radiation dose per fraction is reduced. 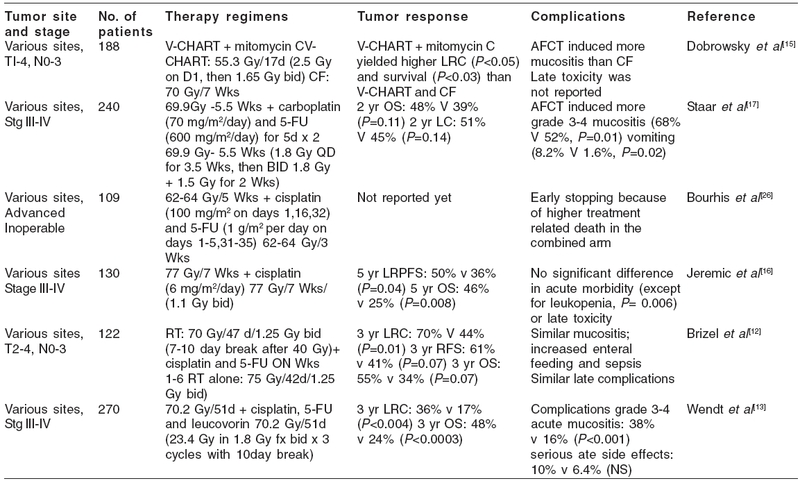 Accelerated fractionation regimens in radiation therapy emerged through the recognition that tumor clonogen proliferation occurring during radiotherapy has a detrimental effect on outcome., Results of large randomized trials addressing the optimization of radiation fractionation collectively show that a number of biologically sound altered fractionation schedules improve the loco-regional (LR) control rate in the order of 10 to 15%, but they have only a modest impact on overall survival., Although several altered fractionation regimens consistently induce more severe acute mucositis than the standard 7-week radiotherapy, the general consensus is that late toxicities are not appreciably increased. Results of scores of clinical trials testing combined modality therapy have been published. Meta-analysis of the data revealed that, in aggregate, cytotoxic agents administered before (induction or neoadjuvant chemotherapy) or after (adjuvant chemotherapy) surgery or radiation do not improve the therapeutic outcome appreciably over loco-regional treatment alone. In contrast, chemotherapy administered concurrently with radiation has improved the 2- and 5-year overall survival rates by 8% but unfortunately, at the expense of increased toxicity. The data of five recent trials addressing standard radiation fractionation with or without cisplatin have been reported.,,,, All five trials showed superior outcome in favor of the combined regimen in terms of loco-regional control or organ preservation and three trials also showed improvement in survival.,, Six other trials also show varying degrees of benefits of combining various radiation schedules concurrently with other chemotherapy regimens.,,,,, Despite these consistent data, the best regimen to be recommended for the treatment of patients with advanced HNSCC remains unclear. Patients with previously untreated locally advanced (stage III-IVB) HNSCC of the oropharynx, hypopharynx or larynx who had a ECOG performance status of 0 to 1, met the blood count and liver function test criteria and opted to receive nonsurgical primary therapy were enrolled. Patients younger than 18 years or with a prior (within 5 years) or synchronous malignancy other than nonmelanoma skin cancer were excluded. A medical history and physical examination, CBC, chest X-ray, computed tomography imaging of the head and neck, diagram of the primary tumor and the neck nodes and dental evaluation were required. The disease was staged according to the 2002 classification of the American Joint Committee on Cancer Staging. The ethics committee of the institute cleared the study and written informed consent was obtained from all the patients. Radiation therapy was delivered in 180 cGy per fraction, 5 fractions a week, to 54 Gy in 30 fractions over 6 weeks to the initial target volume encompassing gross tumor and clinically involved nodes along with regions of potential contiguous and lymphatic spread. At 32.4 Gy in 18 fractions (i.e., latter part of week 4), a second daily dose of 150 cGy per fraction (with at least a 6-hour interval) was administered to the boost volume covering gross tumor and the involved nodes for a total of 18 Gy in 12 treatment days. The primary tumor and clinically and radiologically involved nodes received 72 Gy in 42 fractions over 6weeks and uninvolved nodes received 54 Gy in 6weeks. A combination of lateral opposed portals was used to treat the primary tumor and lymph nodes in the neck. Both fields were treated on each treatment day using a Telecobalt teletherapy machine. Cisplatin was administered in a dose of 100 mg/m 2 intravenously on days 1 and 22 with ondansetron or granisetron premedication and vigorous hydration and diuresis. 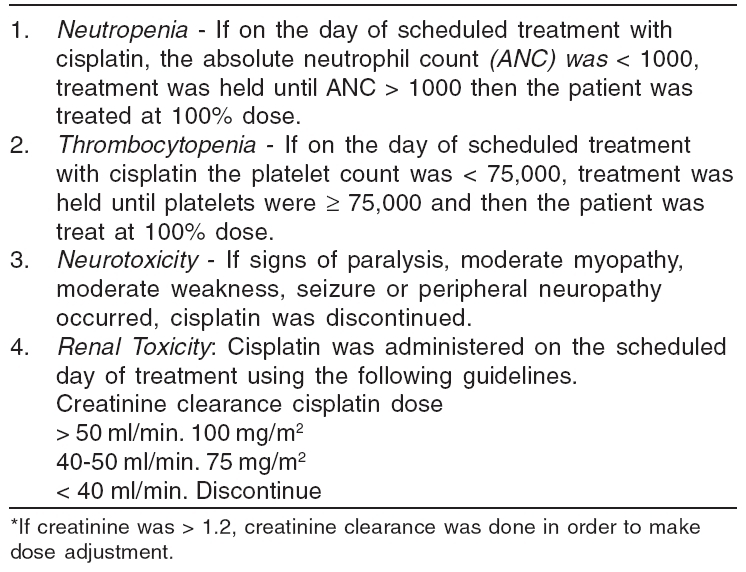 Guidelines for dose modification because of cytopenia, neurotoxicity or nephrotoxicity were specified in the protocol [Table - 1]. Neck dissection was allowed for patients with multiple neck nodes or with lymph nodes exceeding 3 cm in diameter (i.e., N2 and N3) when complete nodal response was not achieved. Neck dissection was required for patients with a palpable or suspicious radiographic abnormality persisting 6 weeks beyond completion of radiation and chemotherapy. Patients were treated as inpatients and underwent weekly examination during treatment. As the toxicities were estimated to be higher than the conventional treatment protocols, our institute requirements necessitated treating all our patients as inpatients after seeking their consent. All patients consented to undergo inpatient care. We however feel that inpatient treatment, though advisable, is not mandatory for this treatment protocol. Following the treatment, first follow-up for evaluation occurred around 6 weeks after completion. Subsequently, patients are being assessed every 3 months for the first 2 years and thereafter it is proposed to follow up every 6 months in years 3 to 5 and annually thereon. Tumor response was assessed as per the RECIST criteria. In addition to tumor and clinical status, acute toxicity was graded. Systemic and acute radiation effects were scored using the National Cancer Institute Common Toxicity Criteria version 2.0. The primary end point of the study was the loco-regional response at 6 weeks. An additional end point was the acute toxicity rate. Apart from describing the distribution of different variables, Chi-square test, cross-tabulation and percentage analysis were applied to the data available to determine the significance and relationship between the variables. Between July 2004 and August 2005, 27 patients met the eligibility criteria of the protocol and were recruited. Three patients were excluded from the study because of the following respective reasons: one patient opted out of the protocol therapy early on, one did not receive protocol therapy and the third one had delinquent data. [Table - 2][Table - 3] list pretreatment patient and tumor characteristics. 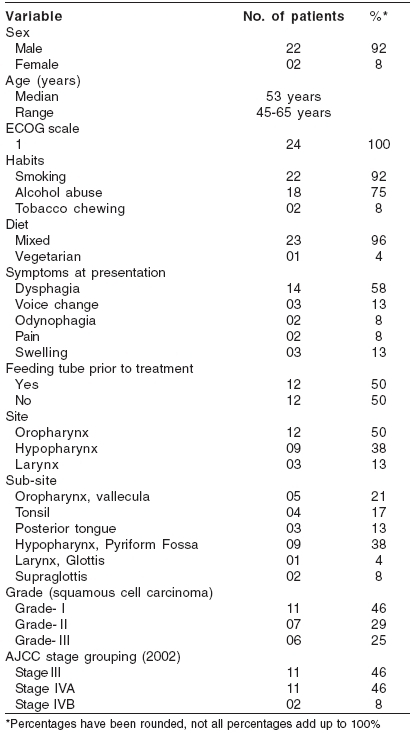 Some significant observations noted on comparison of patients with respect to different primary sites were that dysphagia and odynophagia were common presenting symptoms in patients with oropharynx; voice change was the common presenting symptom among patients with laryngeal cancer; and in hypopharyngeal cancers, the common presenting symptoms were swelling, pain and dysphagia ( P < 0.01). Nasogastric tube feeding was increasingly required prior to treatment for cancers of the hypopharynx and oropharynx ( P < 0.05). Computed tomography helped upstage the disease in 16 patients (67%). The fractionation regimen was according to protocol specification in all patients (100%). The duration of radiation therapy was £46 days in 22 patients (92%) and was 47-51 days in 2 patients (8%). All the patients received both cycles of cisplatin. Dose modification for the second cycle was required in 2 patients because of toxicity. All patients received therapy as per protocol or acceptable variations for both radiation and chemotherapy. Response to therapy was recorded in 23 patients (95.8%). This included a complete response in 19 patients (79.1%) and partial response in 4 patients (16.7%). One patient (4.2%) had progressive disease; there was progression of disease at the primary tumor site, while there was partial response at the nodal site. Of the 4 patients with residual disease (partial response), 2 patients (8.3%) had residual disease at the primary site, one patient (4.2%) had residual disease of the nodes and 1 patient (4.2%) had residual disease at both the primary and nodal site. [Table - 4] shows the response distribution and [Figure - 1] illustrates the stage-wise response. A significant observation was the association between the grade of squamous cell carcinoma and complete response; 100% of grade I, 85.7% of grade II and 33.3% of grade III carcinomas showed complete response ( P < 0.01). With respect to site, 100% of laryngeal cancers, 88.9% of hypopharyngeal cancers and 66.7% of oropharyngeal cancers showed complete response ( P = NS). One hundred percent of T2 tumors, 92.3% of T3 tumors and 71.4% of T4a tumors showed complete response ( P = NS). With respect to nodal stage, 100% complete response was observed among patients with N1 and N2b lesions, while N2c and N3 lesions showed 84.6 and 50% complete response respectively ( P = NS). One patient died of sepsis and pneumonia attributable to treatment-induced neutropenia (grade 5 toxicity); the lethal event occurred during the acute period and within 5 weeks of completing the treatment. The patient had shown complete response to the treatment . Three patients (12.5%) experienced acute grade 4 side effects and 17 patients (70.8%) had acute grade 3 side effects - the predominant adverse event being mucositis. The most common acute grade 4 side effects in decreasing frequency were mucositis and hematological toxicity. Grade 3 side effects commonly occurred in relation to mucositis, skin reactions, hematological toxicity, nausea/vomiting, dysphagia and renal toxicity. [Table - 5] lists the type and frequency of adverse events. There was no significant relationship between the toxicities observed and the site and stage of disease and the type of response. Of the 12 patients who did not receive any feeding procedure prior to the start of treatment, 6 (50%) received some form of feeding procedure or parenteral nutrition during and after treatment. Only one patient (4.2%) continues to have a feeding tube on last follow-up. With respect to the findings that a number of modified radiation fractionation and concurrent chemoradiation regimens are more effective than conventionally fractionated radiation therapy in the treatment of advanced HNSCC, there is an enthusiasm to test the combination of altered fractionation regimens along with chemotherapy. In a retrospective study, for example, Wolden et al compared the data of 50 patients with nasopharyngeal carcinoma who had received concomitant boost radiation with two cycles of concurrent cisplatin (plus cisplatin-based adjuvant chemotherapy in most cases) with the data of an earlier cohort of 51 patients matched for prognostic factors who were treated with radiotherapy alone. They showed that the loco-regional control, progression-free survival and overall survival rates were better in the combined treatment group. Of note is the fact that the regimen used was comparable to treatment regimens used by many cooperative groups and this study. In comparison with chemoradiation treatment strategies attempted in this institution, this treatment protocol compares favorably. A concurrent chemoradiation study conducted in this institution with conventional radiation and concurrent chemotherapy using cisplatin (3 cycles) had yielded a complete response rate of 69% and acute grade 3 toxicity rates of 61.6%. Another study that evaluated hyperfractionated radiation therapy and concurrent cisplatin-5FU chemotherapy (2 cycles, week 1 and 5) recorded a complete response of 73.1% and acute grade 3 toxicity of 62%. Thus, with a marginally increased but acceptable level of toxicity, the response rate and feasibility achieved in this study were an improvement by about 6-10%. A study that evaluated altered fractionation radiation therapy alone delivered by accelerated concomitant boost regimen for loco-regionally advanced HNSCC at this department recorded a complete response rate of 60% and acute grade 3 toxicity of 46.2%. The results of six phase III trials testing the efficacy of such combinations of altered fractionation regimens with concurrent chemotherapy against radiation alone have been reported. The radiation regimens used were accelerated fractionation in three trials,, hyperfractionation in one study and split-course altered fractionation in two trials.,, The results of these trials are listed in [Table - 6]. Collectively, most trials show that combinations of modified fractionation regimens with chemotherapy achieved better local control and, in several trials, improved survival compared with standard or altered fractionation alone. However, the value of altered fractionation in the concurrent chemoradiation setting (i.e., the potential benefit of combining altered fractionations instead of standard fractionation with chemotherapy) has not been tested. Building on the results of RTOG 90-03, which show loco-regional tumor control benefit by concomitant boost regimen, RTOG 99-14 undertook a phase II trial to determine the feasibility of delivering two cycles of Cisplatin (100 mg/m 2) on days 1 and 22 of ACB in a cooperative group setting. This study showed an estimated 2-year overall survival and disease-free survival of 71.6 and 53.3% respectively. The complete response rate in this study was 83% and acute grade 4 and grade 3 toxicity rates were 25 and 64% respectively. Our study was based on the RTOG 99-14 trial, but in the setting of a developing country and a high-load Telecobalt treatment facility. All the patients completed the treatment, both radiation and chemotherapy, as specified or with very minor variations. The acute toxicity of the treatment was severe, but this was expected. The toxic death rate was 3.7% (1 patient) and is in the range of 2-5% observed in other trials testing cisplatin-based chemotherapy with radiation therapy., Comparing the acute toxicity of this study with trials conducted by several institutions is difficult because of the inconsistency in recording and reporting of toxicities, as clearly pointed out by Trotti and Bentzen. These authors noted that four different recognized grading systems and two descriptive efforts had been used in reporting the results of nine frequently cited trials addressing the combination of radiation and chemotherapy in HNSCC published within the last decade. Comparison of the results of this study with these other trials revealed similar incidences of grade 3 and grade 4 adverse effects. This data shows that it is feasible to combine ACB and full-dose mono-chemotherapy using cisplatin with manageable, although substantial, toxicity. The compliance to therapy was high and the loco-regional response achieved compared favorably with ACB alone or other concurrent chemoradiation regimens using standard or altered fractionation regimens tested by the Institute. It also compares well with the available literature. An extended phase II trial and a new phase III trial comparing ACB plus cisplatin against standard radiation plus cisplatin are being planned at the institute to determine whether the use of ACB in the concurrent chemoradiation setting further improves outcome. We wish to thank the Dean of our institution, Prof. Kalavathy, for permitting us to carry out this study at the department; and the Department of Radiology Physics for all their support. The assistant professors, postgraduate students, nurses and ward staff are thanked sincerely for all their help in patient care. The Department of Preventive and Social Medicine lent us support in the data management and planning of the study; we thank them too. We express our thanks to Miss Niraimathi, who helped us with the statistics. We wish to acknowledge the support of our families and the cooperation of our patients and the blessings of the Almighty without which this work would have been impossible. 1. Nguyen LN, Ang KK. Radiotherapy for cancer of the head and neck: Altered fractionation regimens. Lancet Oncol 2002;3:693-701. 2. Barendsen GW. Dose fractionation, dose rate and iso-effect relationships for normal tissue responses. Int J Radiat Oncol Phys 1982;8:1981-97. 3. Thames HD Jr, Withers HR, Peters LJ, Fletcher GH. Changes in early and late radiation responses with altered dose fractionation: Implications for dose-survival relationships. Intl J Radiat Oncol Biol Phys 1982;8:219-26. 4. Bernier J, Bentzen SM. Altered fractionation and combined radiochemotherapy approaches: Pioneering new opportunities in head and neck oncology. Eur J Cancer 2003;39:560-71. 5. Pignon JP, Bourhis J, Domenge C, Designe L. Chemotherapy added to locoregional treatment for head and neck squamous-cell carcinoma: Three meta-analyses of updated individual data. MACH-NC Collaborative Group. Meta-Analysis of Chemotherapy on Head and Neck Cancer. Lancet 2000;355:949-55. 6. El-Sayeed S, Nelson N. Adjuvant and adjunctive chemotherapy in the management of squamous cell carcinoma of the head and neck region: A meta-analysis of prospective and randomized trials. J Clin Oncol 1996;14:838-47. 7. Al-Sarraf M, LeBlanc M, Giri PG, Fu KK, Cooper J, Vuong T, et al . Chemoradiotherapy versus radiotherapy in patients with advanced nasopharyngeal cancer: Phase III randomized intergroup study 0099. J Clin Oncol 1998;16:1310-7. 8. Adelstein DJ, Li Y, Adams GL, Wagner H Jr, Kish JA, Ensley JF, et al . An intergroup phase III comparison of standard radiation therapy and two schedules of concurrent chemoradiotherapy in patients with unresectable squamous cell head and neck cancer. J Clin Oncol 2003;21:92-8. 9. Forastiere AA, Goepfert H, Maor M, Pajak TF, Weber R, Morrison W, et al . Concurrent chemotherapy and radiotherapy for organ preservation in advanced laryngeal cancer. N Engl J Med 2003;349:2091-8. 10. Cooper JS, Pajak TF, Forastiere AA, Jacobs J, Campbell BH, Saxman SB, et al . Post-operative concurrent radiotherapy and chemotherapy for high-risk squmaous cell carcinoma of head and neck. N Engl J Med 2004;350:1937-44. 11. Bernier DM, Domenge C, Ozsahin M, Matuszewska K, Lefebvre JL, Greiner RH, et al . Postoperative irradiation with or without concomitant chemotherapy for locally advanced head and neck cancer. N Engl J Med 2004;350:1945-52. 12. Brizel DM, Albers ME, Fisher SR, Scher RL, Richtsmeier WJ, Hars V, et al . Hyperfractionated irradiation with or without concurrent chemotherapy for locally advanced head and neck cancer N Engl J Med 1998;338:1798-804. 13. Wendt TG, Grabenbauer GG, Rodel CM, Thiel HJ, Aydin H, Rohloff R, et al . Simultaneous radiochemotherapy versus radiotherapy alone in advanced head and neck cancer: A randomized multicentre study. J Clin Oncol 1998;16:1318-24. 14. Calais G, Alfonsi M, Bardet E, Sire C, Germain T, Bergerot P, et al . Randomized trial of radiation therapy versus concomitant chemotherapy and radiation therapy for advanced stage oropharynx carcinoma. J Natl Cancer Inst 1999;91:2081-6. 15. Dobrowsky W, Naude J. Continuous hyperfractionated accelerated radiotherapy with/without mitomycin C in head and neck cancers. Radiother Oncol 2000;57:119-24. 16. Jeremic B, Shibamoto Y, Milicic B, Nikolic N, Dagovic A, Aleksandrovic J, et al . Hyperfractionated radiation therapy with or without concurrent low-dose daily cisplatin in locally advanced squamous cell carcinoma of the head and neck: A prospective randomized trial. J Clin Oncol 2000;18:1458-64. 17. Staar S, Rudat V, Stuetzer H, Dietz A, Volling P, Schroeder M, et al . Intensified hyperfractionated accelerated radiotherapy limits the additional benefits of simultaneous chemotherapy. Results of a multicentre randomized German trial in advanced head and neck cancer. Int J Radiat Oncol Phy 2001;50:1161-71. 18. Fu KK, Pajak TF, Trotti A, Jones CU, Spencer SA, Phillips TL, et al . A Radiation Therapy Oncology Group (RTOG) Phase III randomized study to compare hyperfractionated and two variants of accelerated fractionation to standard fractionation radiotherapy for Head and Neck squamous cell carcinomas: 1st report of RTOG 9003. Intl J Radiat Oncol Biol Phys 2000;48:7-16. 19. Million RR, Cassisi NJ, Stringer SP, et al . Management of the neck for squamous cell carcinoma, in Million RR, Cassisi NJ (editors): Management of Head and Neck Cancer. J. B. Lippicott: Philadelphia, PA; 1994. p. 75-142. 20. Therasse P, Arbuck SG, Eisenhauer EA, Wanders J, Kaplan RS, Rubinstein L, et al . New guidelines to evaluate the response to treatment in solid tumors. European Organization for Research and Treatment of Cancer, National Cancer Institute of the United States, National Cancer Institute of Canada. J Natl Cancer Inst 2000;92:205-16. 21. Wolden SL, Zelefsky MJ, Kraus DH, Rosenzweig KE, Chong LM, Shaha AR, et al . Accelerated concomitant boost radiotherapy and chemotherapy for Nasopharyngeal Carcinoma. J Clin Oncol 2001;19:1105-10. 22. Bourhis J, Lapeyre M, Tortochaux J, et al . Preliminary results of the GORTEC 96-01 randomized trial comparing very accelerated radiotherapy versus concomitant radio-chemotherapy for locally inoperable HNSCC. Int J Radiat Oncol Biol Phys 2001;51:39. 23. Bridget GP, Kwok B, Baldwin M, Williams JR, Smee RI. Craniofacial resection for paranasal sinus cancers. Head Neck 2000;22:772-80. 24. Ang KK, Harris J, Garden AS, Trotti A, Jones CU, Carrascosa L, et al . Concomitant boost radiation plus concurrent cisplatin for advanced head and neck carcinomas: Radiation therapy oncology group phase II trial 99-14. J Clin Oncol 2005;23:3008-15. 25. Trotti A, Bentzen SM. The need for adverse effects reporting standards in oncology clinical trials. J Clin Oncol 2004;22:19-22. 26. Garden AS, Harris J, Vokes EE, Forastiere AA, Ridge JA, Jones C, et al . Preliminary results of radiation therapy oncology group 97-03: A randomized phase III trial of concurrent radiation and chemotherapy for advanced squamous cell carcinoma of the head and neck. J Clin Oncol 2004;22:2856-64. Dhaneshor Sharma, T., Tomcha, Th., Anisha, M., Indibor, Y., Khelendra, N.